Suståne fertilizers are the new generation in environmentally friendly plant nutrition with minimal impact on the non-target environment. Suståne 18-1-8+Fe (iron) is an organic based nitrogen fertilizer blend, ideal for top-dressing lawns, fairways and sports fields. Derived from aerobically composted turkey litter, hydrolyzed feathermeal, ammonium sulfate, iron sulfate, methylene urea, sulfate of potash and sulfur coated urea. While traditional fertilizers supply plant growth nutrients, they do not supply the organic matter required to maintain quality growth. 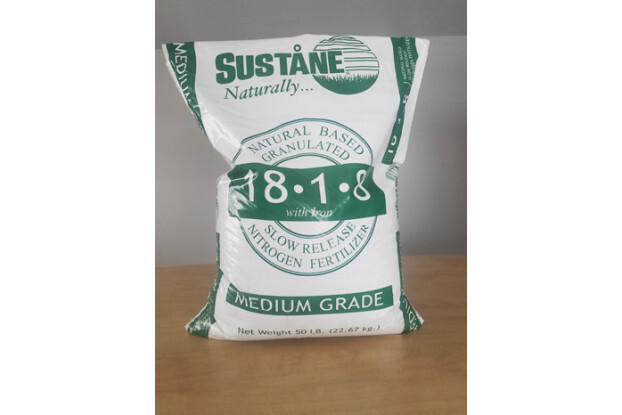 A balanced and naturally based fertilizer, Suståne 18-1-8+Fe is good for application at any time of year for evenly green grass during the growing season. The added iron (Fe) helps lawns maintain their optimal color during hotter summer months. Professional landscapers have increasingly turned to Suståne 18-1-8+Fe for use on high maintenance turf and landscaped environments. Suståne 18-1-8+Fe is also an alternative to concerns over traditional lawn fertilizers being key contributors to surface and groundwater pollution. Using slow-release fertilizers, not over-fertilizing your lawn and sweeping up excess fertilizer from sidewalks and driveways can help prevent ground and surface water pollution. NOTE: Suståne 18-1-8+Fe contains iron (Fe). In order to prevent rust stains, thoroughly sweep all concrete and stone surfaces free of excess product before irrigating. Top-dressing Existing Lawn. Broadcast using a seed spreader in two directions.